Rewilding provided the surprise result of the meeting so far when overturning Australian superstar and long odds-on favourite So You Think by a neck in the Prince Of Wales’s Stakes to give the Godolphin team its fifth win in the race and second-season trainer Mahmood Al Zarooni his first at the Royal Meeting. Frankie Dettori, who won this race in consecutive years on Fantastic Light (2001) and Grandera (2002), said of Rewilding who was a 17/2 chance: “That’s one of the best fights there’s been for a while. “Two great champions fought to the line. That was one of those epic Royal Ascot races that we’ll remember for a while. My fellow doesn’t get the credit he deserves but now we know the key is not to over-race him. Al Zarooni said: “We always plan the races with His Highness Sheikh Mohammed and he said that we needed a fast pace so we put Debussy in to make sure it was fast. Simon Crisford, racing manager for Godolphin, said: “Rewilding takes a while to get into his rhythm and that’s why Frankie gets on well with him. He gets him into that rhythm and then he’s got that great finishing touch. Sheikh Mohammed, the driving force behind Godolphin, said: “All the races give you pleasure but this is a special one because of the way Rewilding was trained and prepared for this race after winning in Dubai. “He has speed so we thought we would try this shorter distance and he did it - he was the better horse. “There has to be a special way of training this horse and the trainer did very well. “We know this horse much better now - I was always hopeful that he would win because I knew he would stay on as well as have speed. Australian superstar So You Think was turned over at odds of 4/11 when going down by a neck to Rewilding in the Prince Of Wales’s Stakes. “It was more my fault than anyone else’s that he got beaten and all I can say is sorry. I think I just didn’t have him fit enough,” said So You Think’s trainer Aidan O’Brien. “I probably didn’t get stuck into him enough at home and he had a heavy blow after the race. “I would expect plenty of improvement from him. He got tired and was just caught by Frankie (Dettori) in the last half furlong and was beaten by a horse that gets a mile and a half well. Sultan Ahmad Shah expressed pride in Sri Putra after the Roger Varian-trained five-year-old carried the owner's colours to third place in the Group One Prince Of Wales's Stakes. The 66/1 shot, partnered by Neil Callan, finished six lengths behind the front pair of Rewilding and the vanquished favourite So You Think in the 10-furlong showpiece. 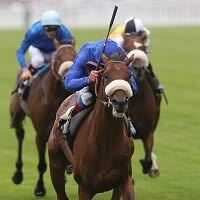 The Sultan commented: "I am very proud to have a horse running in a Group One race here at Royal Ascot. "He ran in the Eclipse Stakes last year but I will talk to my trainer about where we will run him next time." A further half a length back in fourth was the French hope, Planteur, winner of the Group One Prix Ganay on his previous start and sent off at 11/2 under Christophe Soumillon. Trainer Elie Lellouche said of the Wildenstein Family's four-year-old: "I am naturally a bit disappointed with that performance and I have no explanation. I have no plans at this moment."